This past weekend we went to Sighetu-Marmatiei for a wedding and we had a little bit of time to visit (for lack of a better word) tourist attractions. We celebrated the lives of loved ones lost at a cemetery, and we mourned the lives thrown away without respect at the memorial. 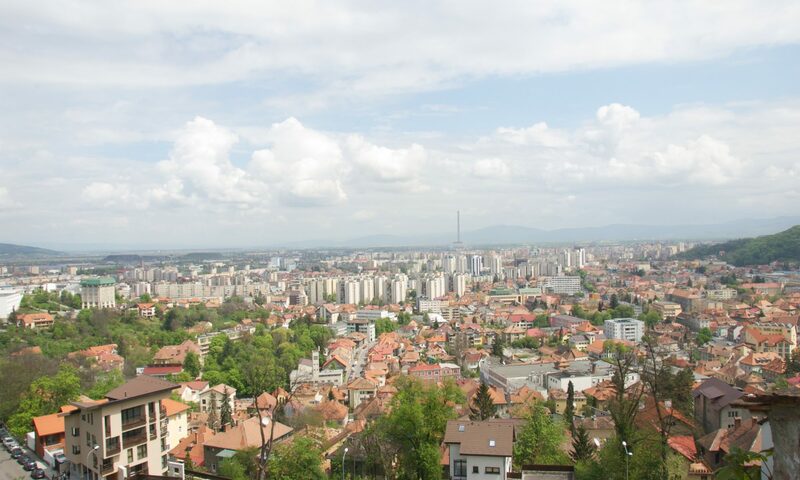 This is Cimitirul Vesele (the Merry Cemetery). The graves stones are carved to depict the activities that the deceased loved doing in his/her life time, how they died, or wishes for those they left behind through a picture and a poem. Some are funny, such as a man who died drinking too much moonshine while riding his tractor and not listening to his momma. Others have a life lesson, like a man who worked hard his whole life for his daughters to earn a living for them and then realizing at the end of his life that he can’t take any of it with him once dead. Then others are tragically sad, like a child who drowned and washed up on the shore. *click on the photos to see them in a larger preview. 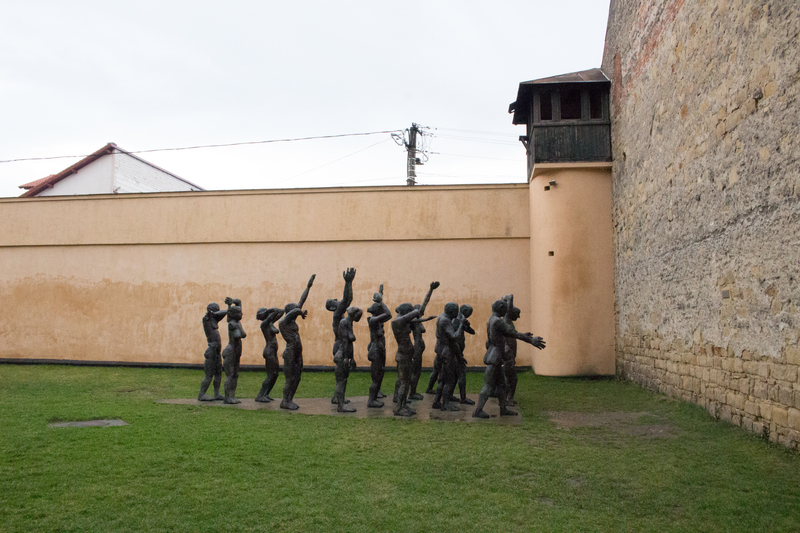 The Communism museum in Sighet is located in the center of town in an old prision. The prison was built in 1897 but from 1945-1955 it was a prison for ministers, academics, economists, military officers, historians, journalists, and politicians. 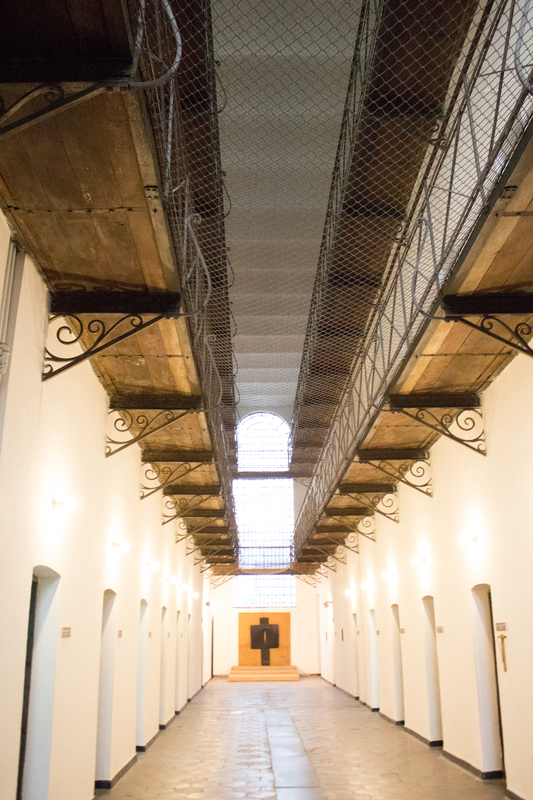 The ruined prison was transformed into a museum in 2000. First, you go through the main entrance room and see this map. It reads “Then when justice doesn’t manage to be a form of memory, a single memory can be a form of justice .” Then you go down the hall, where it is lined with pictures of those who were imprisoned here. 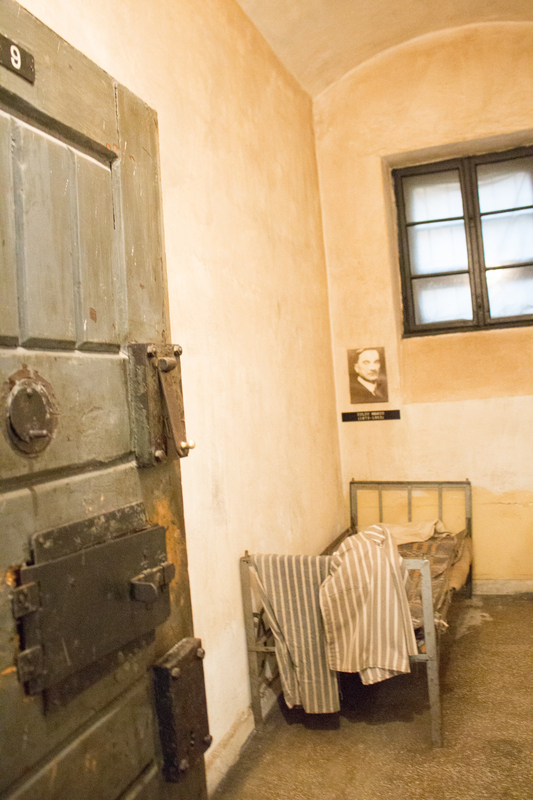 You come to a huge iron gate and you can see all three stories of cells. Each level has a chain net seperating it from the next and you walk past each cell on old creaky wooden boards. I felt on edge from the pictures and seeing a video testimony of a former prisoner and a former guard before entering the main area of cells, but the feeling of claustrophobia felt so overwhelming in this space. 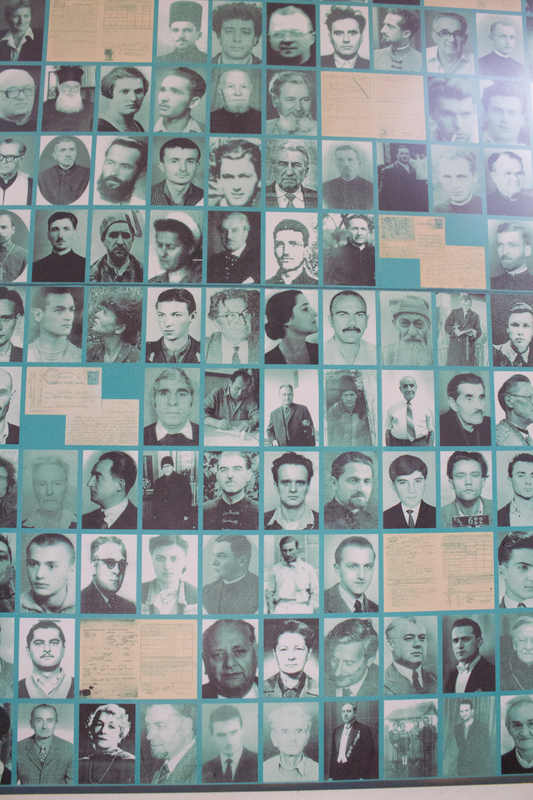 Each cell has been set up with a different theme and different information about communism in Romania. 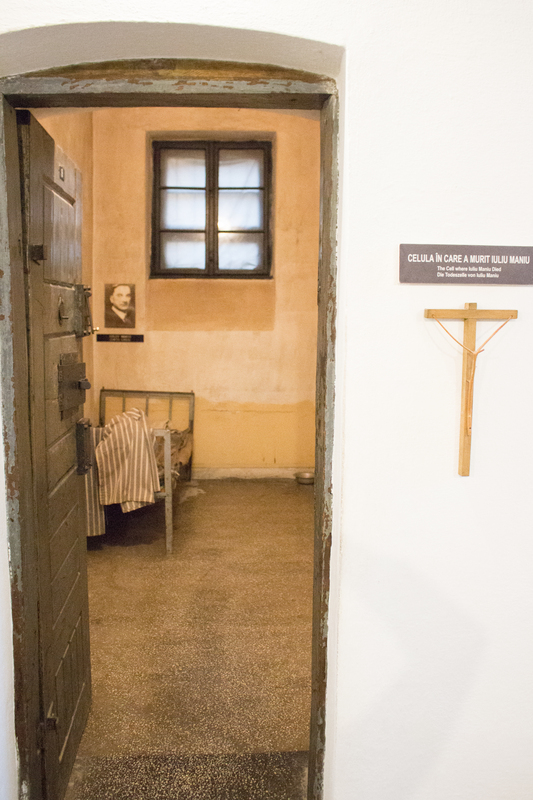 This room is where a former prime minister was imprisoned for standing against the communist party and he ultimatley died here. 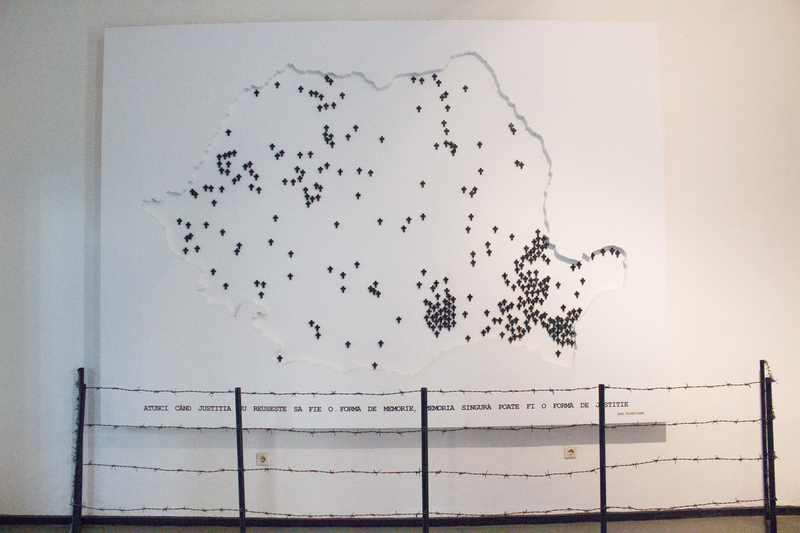 Once you finish walking through the cells you can go to the courtyard where they have set up a memorial for the almost 8000 people who died in prisons, camps, and deportation places in Romania. The wall leading down to a room where you can light a candle for those who died is lined with names. The statues in the field are “The convoy of martyrs” by Aurel Vlad. If you are ever in the area of northeast Romania, this is a must-see because we need not forget. I am the age of Romania’s freedom from Communism, … 27 years old. Thanks for sharing this, Lauren!